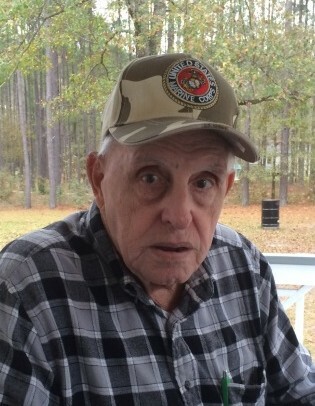 Mr. Robert Francis Presley, 84, entered into rest Saturday morning, January 19, 2019, at his home in Cottageville. He was the loving husband of the late Mrs. Joan Watson Presley. Born January 17, 1935, in Watertown, New York, he was a son of the late Francis Henry Presley and the late Ella Rose Schultz Presley. He served our country faithfully in the United States Marie Corps until his retirement and had served during the Vietnam Conflict. He was retired from sales and as a technician of a pest control company. He and his late wife made Cottageville their home in 1985, having been a faithful member of Cottageville Baptist Church. Surviving are: two sons, Jeff Carnes and John Carnes; five daughters, Janet Fox, Tonia McDonald, Teresa Wheeler, Jeanine Petit and Donna Presley. There are sixteen grandchildren as well as twenty-three great grandchildren. A celebration of his life will be conducted 2 o’clock Tuesday afternoon, January 22, 2019, from Cottageville Baptist Church, 11643 Cottageville Highway, Cottageville, with military honors. The family will receive friends following the service in the church sanctuary.